My prep for this event was fantastic. Stage 1: Don’t touch road bike since June. Stage 2: Get proper pished on Thursday with 4hrs sleep. Stage 3: Go to Rollapaluza XI Friday night, ride home at 3am, 4hrs sleep before getting 5.5hr train to Builth Wells, Wales. I met a couple of other riders on the train. One was looking to set a fast time (he’s a London Dynamo Cat 2 so it’s expected) and the other was losing his sportive virginity and just hoping to finish. At Builth we parted and I headed into town for some food as my B&B was out of town so I didn’t expect there to be a nearby pub (there wasn’t). I found a little cafe that let me keep an eye on my bike and had some veggie lasagne and a milkshake. Tried a Welsh Cake too – thanks Wayno – I should’ve grabbed some more for the B&B. Waited in there for the rain to stop, whilst cursing the fact I only brought jeans and one pair of knicks, I met another rider Kristian and Cat 2 Cameron again. Eventually saw a gap in the rain and rode the 10k north to the B&B. The B&B I stayed in was Wernhir Farm run by Monica Fairclough. It was sweet. I laid down on the bed and… silence. No rain noise, no wind noise, no cars, no sirens, no shower noise, no toilets flushing. I couldn’t believe how quiet it was! Nice. Up (too early) I had a fry-up. I don’t usually eat these (certainly not before a ride!) but today was always going to be a bit of fun rather than a speed fest, so.. meh. It was a bit wet riding to the start. I registered and rolled up to the start line behind a large waiting bunch. Slowly left the start after swiping my wrist band timing chip and rolled along out of Builth Wells. At the 3.5k mark (no joke) I see a gradient sign saying 16% uphill. Oh crap, these guys aren’t mucking about are they?! Into the wind (yes, even though it was hilly there was a very strong head or cross wind blowing) and drizzle. At the 10k mark after the 16%’er warm-up, guess what folks? Have some of this 25% hill. Thankfully I’d gone home on Friday and swapped my 23T for a 27T cassette! At 30k a guy was stopped on the side of the road and I asked him if he was okay. He said his wheel was busted so I stopped and offered to call the organisers to arrange a pickup. I trried both numbers but couldn’t get a signal and told the bloke I’d call from up on the next hill. He seemed to have sorted out the issue and said he’d just go to the food stop (another 16k) and sort it from there. It’s nice to be asked if you need help when you’re on the roadside so I tend to ask people. This process of wind, rain and an endless supply of hills continued for 50k/30mi until Devil’s Staircase a steep, twisty bugger of a climb that saw most of the people dismounting and walking as I rode past. One guy almost ran into me as he swerved side to side, such was the gradient. At the top was the first food stop. I helped myself to some cake and a ‘nana. As I was taking this easy and “enjoying myself” I had a bit of a stretch and grabbed more cake before carrying on. There was a turn off here for the Little Devil 100k option. “haha” I laugh in the face of your bail out route! Some other riders had clearly had enough already and were coming back down the road to take the 100k option. The valleys were fantastic. For one, they gave some respite from the climbing. Secondly, they were great to zoom down and they looked stunning with fast flowing rivers cutting through them (no I didn’t go for a swim this time!). Huge descent along the valley with a strong tailwind now. It went on for ages and if I actually turned the pedals would’ve easily cracked 80kph. As it was, coasting at 70kph around stupid sheep walking onto the road in front of me was enough to deal with. Killer sheep. Fantastic views over a lake here and then it started to get a bit more covered, more trees lined the road and it was more forest than open fields. Probably went a bit hard a bit early because the hills, although shorter, just kept coming! 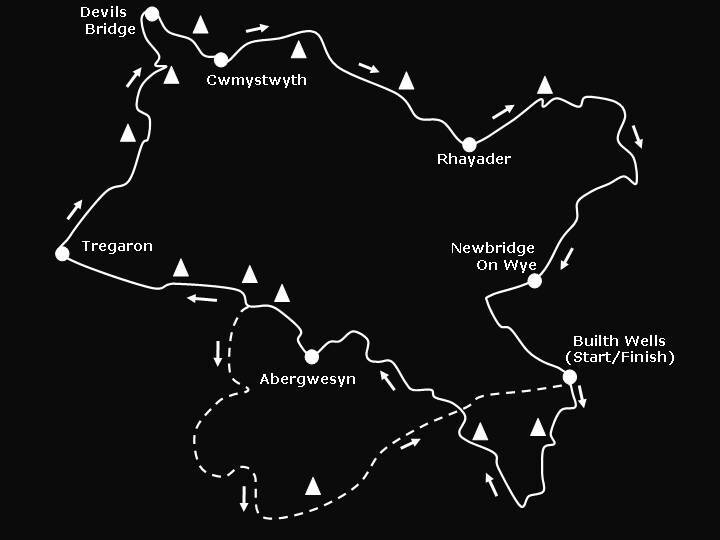 I saw the sign for Newbridge-on-wye and knew I was close but the organisers were cheeky and instead of a direct route took riders around the much bumpier B roads. Still, kept the pace up and made Builth Wells and the finish line. Woo! Great ride! Sat around at the finish for a couple of hours recovering and chatting to Kristian who I’d met in the cafe on Saturday. Then 10k back to the B&B for a wash and rest. Job done. Good work Hipshtar, looks like minimal sleep the day prior definately works for you. I’ve seen "Black Sheep" so you know why I was avoiding the crazy little feckers! I’m okay with riding if it’s different. New places, some hills, new people, bit of a challenge and I’m okay. It’s clubrun after clubrun in the Chilterns or lap after lap of Richmond Park that I can’t bring myself to do. No offence to Willesden CC members I’m just lacking a little get up and go when it comes to heading out. Sleep (or lack of) doesn’t seem to affect my riding. It does, however, make work a bit of a slog.